Green Drinks Edmonton: Want to meet people involved in good things in Edmonton? Since 2010, The Local Good has been hosting the local version of Green Drinks International’s mixers on the first Wednesday of most months (taking the summer and December off). Since 2012, we’ve been doing Green Drinks with a twist, organizing each evening along a theme – such as local food, good business, activism & advocacy, sustainable housing, alternative energy, and local resilience – to facilitate introductions and foster collaborations. Cash Mobs Edmonton is a quarterly event where the good people of Edmonton pick a deserving local independently-owned business (or a neighbourhood full of them!) to mob with their cash. Edmonton Resilience Festival is an annual event focused on helping Edmontonians gain the skills they need to live a more resilient lifestyle while building a more resilient community. 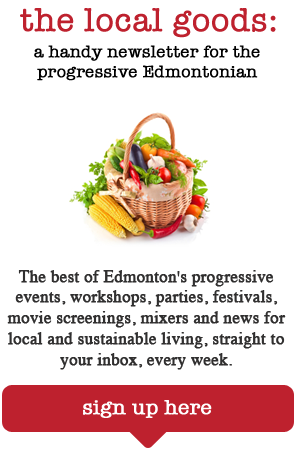 Founded by the The Local Good, ERF has since been passed on to our friends at the Edmonton Permaculture Guild. The Good Hundred Experiment: Between 2012 and 2015, The Local Good held an annual, application only event that brought together Edmontonians involved in good work in their own communities to meet each explore, get new perspectives on their own work and explore possibilities of collaboration across sectors. The Good Hundred Experiment is currently on hiatus.